By Greg Simpson, Pres/CEO, Simpson Seeds Inc.
Seeding is well underway. This year we started seeding on April 27th. This is one of the earliest starts to seeding in many years. The field conditions on our farm are excellent. The soil profile is saturated down 4 feet. It is always good to start off the crop year with some reserve moisture. Surface soil conditions are dry. There isn’t any standing water or sloughs to contend with, so farmers are able to drive the entire length of the field without having to navigate around wet areas. 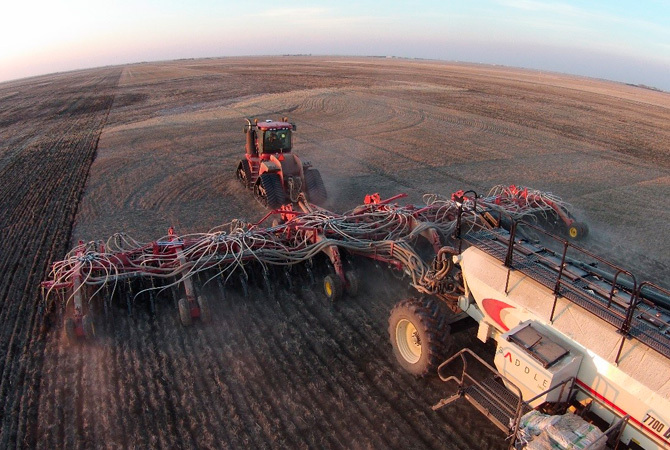 This speeds up seeding and increases the number of acres seeded per day. With the forecast, we expect to be done seeding by next Thursday, May 12th. Likely, this will be the earliest finish in our farming history. I don’t think there is a single farmer that wouldn’t appreciate an inch of rain in the next week or two. Germination may become an issue for those who farm lighter land or have not had much rain in the past several months. 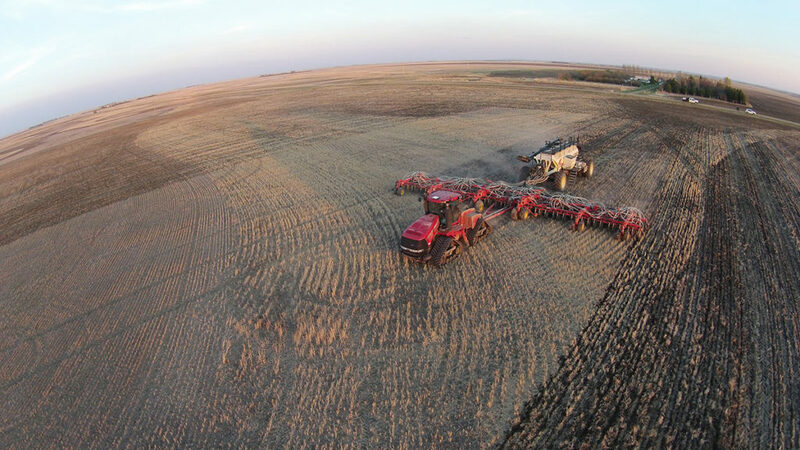 According to the Saskatchewan Ministry of Agriculture report, seeding progress is about 18 per cent complete. Lentils are 30% complete, and Field peas 42% complete. The warm dry conditions are forecasted to continue according to Drew Learner in his recent prognostication. If the temperature remains warmer and dryer than normal, then the “wall of worry” will begin to drive markets higher, as expected yields will be lower than normal. El Nino is forecasted to weaken this summer and then the weather will evolve to La Nina for the last half of June. La Nina generally brings cooler and wetter moisture conditions. One of the best crops to resist drought is lentils. his plant is amazing in its ability to withstand drought stress, especially large green lentil varieties such a CDC Greenstar. If we can catch a couple of good rains in June, this will provide growers and the market some relief from the stress caused by prolonged dry conditions. Furthermore, lentils have an indeterminate growth habit. This means the days to maturity can vary from 90 days to 110 days for Large Green lentil varieties, while small seeded green and red lentil varieties range from 85 days to 95 day to maturity. Meanwhile, seeding of lentils in the USA is over 60% complete as they typically start seeding in mid-April. The USDA announced seeded acres in the United States would jump 72% over last year to a record 850,000 acres. If realized, a return to average yields would see production nearly double to 450,000 metric tons (MT). Farmers were responding to record high prices and excellent movement. The combined total production in lentils in North America could top 3.75 million metric tonnes. World lentil markets do not see this as a burdensome supply, but there should be a building of ending stocks this crop year.